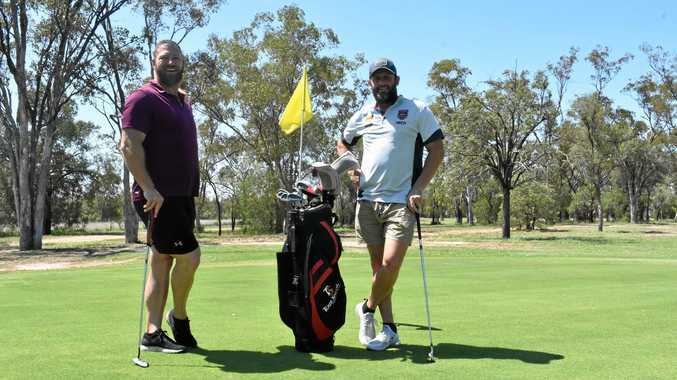 GOLF: A massive 83 golfers took part in a charity tournament for Men of League on Saturday, filling up both the front and back nine with the sheer number of participants. Part of the Queensland Rugby League drought relief goodwill tour, the Men of League golf day was not just a chance for the QRL touring party to wind down with a day on the green; they also used it as a final opportunity to spread some cheer in Roma. Before tee-off, golfers and football stars packed into the clubhouse, where major sponsor of the golf day, AAM investor group, presented $5000 to the NRL State of Mind program. Like the Men of League charity, the program is about looking after the people in rugby league communities like Roma, but has a focus on mental health. Roma and District Rugby League chairman and Roma Men of League committee member Peter Flynn said the day reflected the philosophy of the QRL goodwill tour. "The Roma Men of League committee has a golf day every year, among other functions, to bring the rugby league community together,” Flynn said. The Roma group, which is less than 10 years old, has already established itself to help those in the league community who need a helping hand, Flynn said. 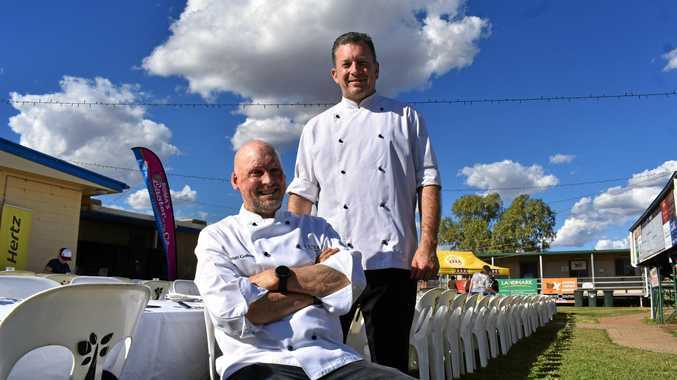 "We first started back in 2011 and we've actually donated to the community and to Men of League participants somewhere in the vicinity of $80,000. "We are very proud of the fact we've been able to help out through flood times, drought times, and hard times,” he said. While the QRL touring party was unable to stay the whole day, Chris Walker and Mick Crocker were special guests at the pre-function. Former players Clinton Toopi and Robert 'Rocky' Laurie were also in attendance, having been invited by former South Sydney Rabbitohs player and Roma local Charlie Frith. The pair entertained the crowd with stories from their careers before heading out on the to course. At the end of the day Brett Pollock, Paul Ladel, Joshua Lambert and Jack Just were the winners on the AAM investor group-sponsored front nine, with a score of 23.625. Mick Brennan, Greg Menzies, Andrew Newton and Pete Sceresini, who travelled from Taroom, ended the day as front nine runners-up, scoring 24.25.